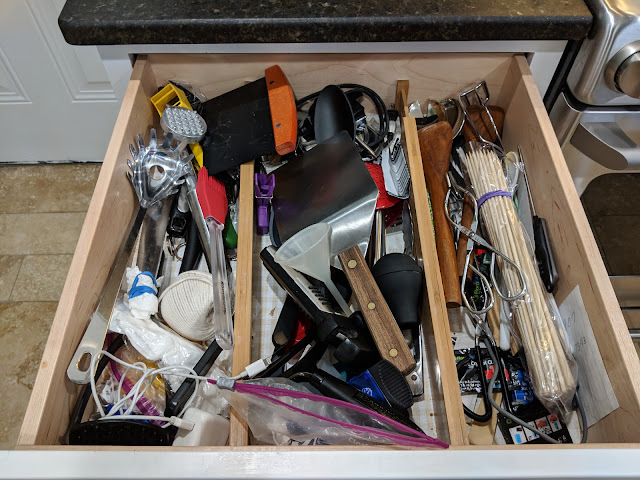 There are two drawers in our kitchen for our collection of utensils. The one to the right of the stove is nice and orderly, containing our most often used tools like spatulas, whisks, peelers, measuring cups and scissors, all of which are small, straight and flat. The drawer below, to the left of the stove, we call the "Island Of Misfit Toys". Like the discarded toys in the Christmas movie, this is our collection of one-off utensils with odd shapes and sizes that make this drawer appear messy and disorganized. Aside from only having one, not two, apparently disorganized drawers, it helps us remember which drawer to find things in. If it's a misfit, go left. Simple rule.